The headlines say the Linsanity beat went on Tuesday night. New York’s final two possessions in its 90-87 win over the Raptors — in which Lin tied the game on a driving and-one and won it with a fearless 3-pointer with half a second remaining — will dominate the highlights for the next day or so, and conversations about Lin’s improbable run will accompany them. The focus will again be on those gaudy final numbers, this time 27 points (for a record total of 136 through five starts) and 11 assists. But for Knicks fans, it should all pale in comparison to the real excitement of Tuesday night’s win. With Lin’s emergence, Amar’e Stoudemire’s return, and Carmelo Anthony still on the way, it was a partial glimpse of a Knicks team they could never have imagined before the season began. Of the two Knicks superstars, Stoudemire figured to be the one capable of a seamless transition to the offense Mike D’Antoni has used with Lin. A high screen with Tyson Chandler had been the basis of Lin’s output since his arrival in the starting lineup, and with Stoudemire’s experience and success as a member of a pick-and-roll tandem in Phoenix, with Steve Nash, it seemed like a natural fit. The hope was that a quality point guard could be the answer to his struggles so far. It was surprising, then, to see Chandler as the big man moving to the top of the key, possession after possession, in the first quarter last night. Nearly every time the Knicks had the ball, the offense was initiated with a high screen from Chandler while Stoudemire stood on the wing, a secondary option if penetration was slowed. The problems with this approach were quickly evident. Toronto spent much of the first half playing excellent pick-and-roll defense — the screener’s man hedging hard on Lin and the weakside defender sliding over to prevent an easy basket from Chandler rolling to the rim. The strategy exposed what Lin needs to be effective and how teams might slow a Lin-Chandler screen-and-roll combination going forward. There are players who are adept at splitting double teams following high screens (Chris Paul, Dwyane Wade), and at this point, Lin is not one of them. His success is almost entirely predicated on his ability to get to the hip of his defender and get in the paint, and for much of the first half, the Raptors were able to prevent him from doing so. Without Lin’s penetration, two things defined the Knicks’ offense for the first 24 minutes: Turnovers resulting from double teams off the high screen and isolation plays for Stoudemire that were a staple of the team’s early-season struggles. With about nine minutes in the third quarter, down 53-42, the Knicks caught an unlikely break as Chandler picked up his fourth personal foul. In the box score, Chandler’s offensive output last night looks excellent (13 points on 5-for-5 shooting), but Toronto’s lack of focus on him as a scorer off the high screen allowed the integrity of the Raptors’ team defense to stay intact. Chandler’s move to the bench shifted Stoudemire into the role of the big man in the screen-and-roll combo, and the result was ideal. With Amar’e’s man unable to help off him to the same extent (for fear of his ability to both slip screens and slide out for a very makeable 18-foot jump shot), Lin was given the step he was missing throughout the first half. What followed was a 30-point quarter, including seven straight from Stoudemire and two wide-open Bill Walker 3-pointers that resulted from Lin drives. The offense continued humming into the fourth quarter, and that’s when Chandler showed off the defensive assets that New York coveted so badly in the offseason. Each time the Raptors moved into the lane, the shot was contested, and after Lin’s layup and free throw to tie the game at 87, Chandler made the type of play that illustrates what kind of defensive anchor he can be. Following a screen, Chandler found himself alone with Leandro Barbosa, typically considered one of the league’s quickest players, out on the left wing. As Barbosa attempted to drive to the rim, Chandler cut him off. Barbosa briefly passed off to Linas Kleiza in order to free himself up for a shot on the right wing, but when he got the ball back, Chandler’s hand was there to force him into a contested 26-footer. Chandler followed his play on the defensive end with an offensive rebound on an Iman Shumpert miss that got the ball to Lin at the top of the key with about 20 seconds remaining. And by now, you know the rest. That shot is the one that will lead SportsCenter all day, but the most exciting play of the Knicks’ season took place with just over seven minutes remaining in the fourth quarter. With Lin and Stoudemire alone on the left side, the two ran a screen-and-roll on the wing that left Stoudemire with the ball on the block after rolling to the basket and getting the pass. Amar’e stopped, made just enough of an up fake to cause a recovering Jose Calderon to fly by, and went up for the one-handed dunk. It was the type of play that only a handful of big men in the league have the balance and burst to finish. How Carmelo will fit into the offense remains to be seen. (A guess is that he will play the weakside scorer that Amar’e was in the first half last night, get his share of sets run for him, and be the ideal scorer to have the ball alone on the wing if the play breaks down.) 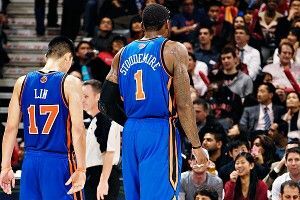 What has become clear is that though Chandler provided a framework of how both Lin and the Knicks could succeed, Stoudemire fits into the perfect version of that plan.